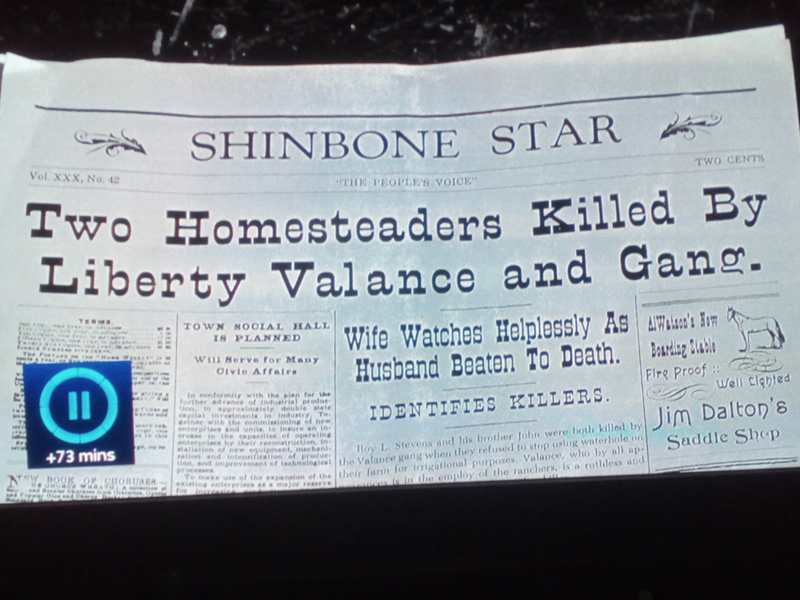 A couple of months ago, I watched an old western movie and found myself drawn to the typeface used for one of the newspaper headlines. I was familiar with French Clarendons, but this one struck me as unusual. I tried to find out what the font was called, but couldn't find an exact match, so I decided to try to create my own version. Given the original headline only had a few characters, many of mine are 'best guesses'. I have already had some great advice from someone who specialises in reverse contrast fonts, so I thought it was a good time to open this up for wider comment. Though I've tinkered with the widths of the UC relative to the lc, I've broadly retained their relative weights. UC diacritics look a bit puny; I'll add some weight at a later date. I've been wrestling with side bearings for weeks. I'm more comfortable with them now than at any point in the past, but still feel unsure. Any thoughts here would be very welcome. Notwithstanding the last comment, my main focus here is form. Do any of the characters strike you as plain 'wrong'? I'm thinking particularly about the /eszett (both UC and lc), /Thorn and /eth (maybe /g as well). I would open up the aperture of /e/ more. It visually closes up and looks like a θ. /r/ looks unbalanced; you may want to extend its baseline serif rightward. Middle arm of /F/ could be a little longer. I always think /A/s without serifs at their apex look bald in this style. Awesome, thanks so much @Craig Eliason. I've tweaked the /e, /r and /f along the lines suggested. I agree about the /A (same for the /V, /v, /W & /w), but the original was bald, so I think I'll keep it as the default. I already have seriffed alts. Did anything strike you as particularly jarring about the spacing? Spacing seems nice and even to me, but on that score I think intended size matters a lot for this kind of design: at small sizes this looks good but blown up it appears rather loose. I started this more as a personal project and don't imagine it has a great deal of commercial value, so didn't really set out with a specific 'intended size'. If anyone did use it, I would expect it to be for headline/display. I can't imagine this would be comfortable reading in text settings. Spacing has caused me no end of problems. I initially tried to make it tighter, but the tail of the /a disrupted the flow. Of course, I could shrink the tail, but it's a key characteristic of the original and I would rather retain it with all its attendant problems than lose it, hence the looser spacing. Just for reference, the original headline used in the movie was set a fair bit looser than I have it! ETA: I know my changing the /g appears at odds with what I said about retaining the characteristics of the original but, though I did create a like-for-like version, I didn't like it. The final version (I think). I’d make the thin horizontals in the middle of /s/a/e/ be closer to the same thickness. I ummed and ahhed about this. I spotted the inconsistency, but was caught in two minds whether to harmonise the weights or retain the quirkiness of the original. Do you think this is a critical flaw? @Craig Eliason with more harmonised /s, /a & /e. I do think it's better (though I might've thickened the others to match the /s/ instead of thinning it down). BTW if your wordspace glyph is what was separating the words in your specimen, you need to narrow it quite a bit. The /a & /e both thickened to be closer to the weight of the original /s. Looks good. /g/ should also be brought into conformity. Is there too much difference in height between the cap serifs and lowercase serifs? Tail of /y/ feels out of character. @Craig Eliason - yes to the last three points (serif height, /w width and /y tail), but this was a conscious choice in order to retain as much of the look and feel of the original as possible. Check the image in my earlier post showing the 'Shinbone Star'. If anything, I've probably made the cap serifs relatively lighter. I had already added some weight to upper bowl of the /g. You think it needs more? Maybe just thicken the link of/g/ at the join would be enough. I'll look at the /g again. I think you're right, it looks a bit pinched. The /f and /j have been problematic from the start. I initially had more substantial hooks, but they caused all sorts of problems with spacing (maybe because of the weight distribution?). I sent an early version to a designer who specialises in reverse contrast faces and his advice was to truncate the /f and /j terminals. I do think they look a little odd, but I don't dislike them, so my inclination is to leave them be. I really appreciate all your feedback, Craig. So, I added a little bit to the /g and also extended the terminals of the /f and /j a little bit. I would say the bottom-left of g could be thinner. Thanks @Jasper de Waard. Does this look better? I started experimenting with an ornamented variation. It was an interesting exercise if only because the process of trying to add ornaments highlighted the need to iron out a couple of wrinkles in the original version. I've never tried anything like this before, so would really welcome any thoughts. I took much on board of the advice given above and eventually sent the font to MyFonts for review. In the meantime, I'd started experimenting with a Cyrillic script, but whilst waiting for the review to be completed, had decided against including it. However, when MyFonts approved the font and asked for a final set of files, I inadvertently included my draft Cyrillic glyphs in the final file, which prompted MyFonts to ask if I would complete the character set. So I have. The attached PDF includes text blocks set in caps, sentence case and lower case. There are a number of rules I've had to follow to keep their design consistent with the Latin script; and to also allow them to have split serifs and pegs added for inclusion in an Ornamented version I'm working on separately. 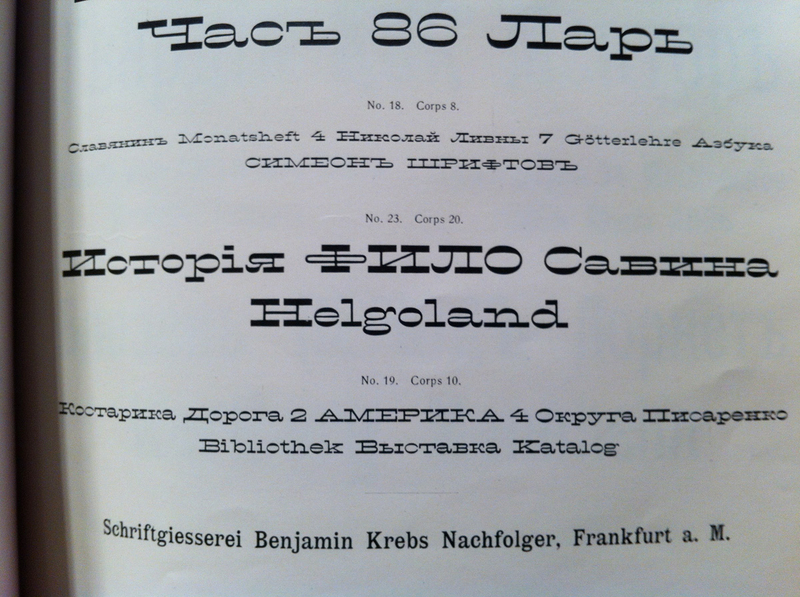 I'd really welcome any feedback on the current draft, since my knowledge of the Cyrillic script is very limited. ** NOTE ** PDF updated. Ф poses a real dilemma for this style, doesn't it! Lol, yes!!! I've looked at how the problem has been solved in similar fonts, but they all require some compromise. I'm even playing around with a /Theta-type variation, with the vertical contained wholly within the circle, but I'm not sure that's an improvement on what I have. The name at the bottom is the founder. I believe this is ca. 1902. I've tried a narrower Ф (/Ef); and also added a serif to the З (/Ze), though not to the /ze, which is keeping with the rules of the Latin script. I've also corrected a few inconsistencies and tweaked the spacing. Do you think anything else needs serious attention? P.S. I would personally loosen up the left legs of Лл and Дд — let them hang out more with а and к and associate a little less with п н et al. Thanks for this suggestion, Kent. I've experimented with caps only at this stage. Do you think it works better? Seems nicer to me. The left leg of Л could maybe stand to be a bit lighter at the top. Or stay thinner longer, down past the midline before widening, in keeping more with the exaggerated top/bottom weight distribution. I felt the same when I looked at these afresh this morning, so I have tweaked them and also added the lower case variants. I think I'm pretty happy with what I have at this point so, unless you (or anyone else) see anything that really doesn't work, I'll move forward with what I have. I'd intended to stick with Latin and Cyrillic, but thought I'd experimented a little with Greek. I would welcome any feedback anyone may have the time to offer some, particularly if you see anything that's plain wrong. I've made a significant number of changes to the Greek, most notably, dropping the serifs from the ascenders and descenders. Other changes include the introduction of a new exit stroke to /alpha, /iota, /mu, /pi and /tau; and a change to the top of /sigmafinal to more closely resemble /sigma. I'd expect tau's top to be like pi's. Maybe worth trying removing the serifs at the top of the center stroke of Psi. Baseline serif of eta feels strange.